Save Marinwood-Lucas Valley - our community, our future: Bike Share Programs: Why? After less than a year of operation, Baltimore is shutting down its bike share program for a month because so many of its bikes were stolen or are heavily damaged. The program began last November with a 175 bikes–40 percent of which had electric boosters–available for rent from 20 different locations, soon increased to 200 bikes and 20 stations. One cyclist spent a day recently visiting all 25 stations and found only four bikes available to potential renters. The city says the private partner that is running the operation is upgrading the locks to reduce theft. In the meantime, the city has two full-time employees tracking down the GPS-equipped bikes so that other people can repair them and put them back into service. Baltimore is far from the first city to have problems with its bike-share program. Seattle’s is attracting only half as many riders as expected. Bike share programs in New York, San Franciscoand many other cities have also had problems. The usual solution (other than better locks) is to greatly expand the program. The key to success, according to one study, is to have a sufficient density of stations. Paris, for example, has bike stations located every 1,000 feet. Washington DC turned its bike share system from a failure to a success by expanding it from 10 stations to several hundred. Similarly, Baltimore–despite its problems–plans to expand its program to 50 stations supporting 500 bikes. The term “success” is used with caution, however, as none of these programs come close to paying for themselves. Washington claims that its program covers its operating costs but not the millions spent starting it up. Most other programs that claim to be successful don’t even cover their operating costs. Those costs can be significant. For one thing, even the best programs still suffer from thefts and vandalism. Paris, which has the largest bike-share program in the world outside of China, reports that well over half its bikes are stolen or vandalized each year. Another problem is balancing. If left alone, bikes tend to accumulate at some stations and disappear from others. Washington DC has two people driving around in vans to move bikes from overcrowded stations to empty ones. Aside from the usual mumbo-jumbo about how all transportation loses money so bikes should too, the fundamental question is why should cities have bike-sharing programs at all? Baltimore spent $2.36 million on its program of 200 bikes; that’s an average of nearly $12,000 per bike. It seems like there are more cost-effective ways of encouraging cycling or improving transportation. Improve the health of the residents. As far as I can tell, no one has ever investigated to see whether any bike-share program has accomplished any of these objectives, much less all of them. Portland’s Biketown system of 100 stations and 1,000 bikes (200 of which were vandalized in one day) claims to have served 189,000 trips in its first eight months, or fewer than 800 trips per day. Yet the American Community Survey says that more than 23,400 Portlanders commute to work by bicycle, which means the bike-share program is a drop in the bucket of Portland cycling. How many of those 800 Biketown trips would otherwise have been on personally owned bikes or walking, which means they did nothing to relieve congestion or reduce air pollution? The IDTP report inadvertently offers the real reason for bike share when it says, “It is possible to plan and implement a system in one mayoral term.” In other words, why should politicians plan a light-rail line that won’t be completed until long after they’ve left office when they can plan and take credit for a bike-share program whose beneficiaries (including the private partners) will help them in their next re-election campaign? Certainly the private partners have a lot to gain from bike sharing. Baltimore is paying its private partner $1,000 for each eight-speed bike and $1,300 for the electric-assist bikes. Yet I can find similarly designed three-speed bikes and a variety of other 8- to 24-speed city bikes for around $500 and electric assist bikes for as little as $600. 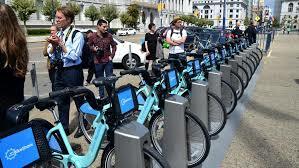 In short, bike sharing seems to be mainly a political ploy to make elected officials look hip and build up support from the few people and companies that truly benefit from the programs. Cities that are truly interested in cycling should do things like maintain the streets (cyclists find rough pavement far more annoying than auto users), make traffic signals responsive to cyclists, and provide safe bicycle boulevards parallel to major arterials.